It has been a while since I have painted sheep. I used to paint them often, but haven't done so for quite some time. Today the inspiration hit and this little herd emerged on my canvas. 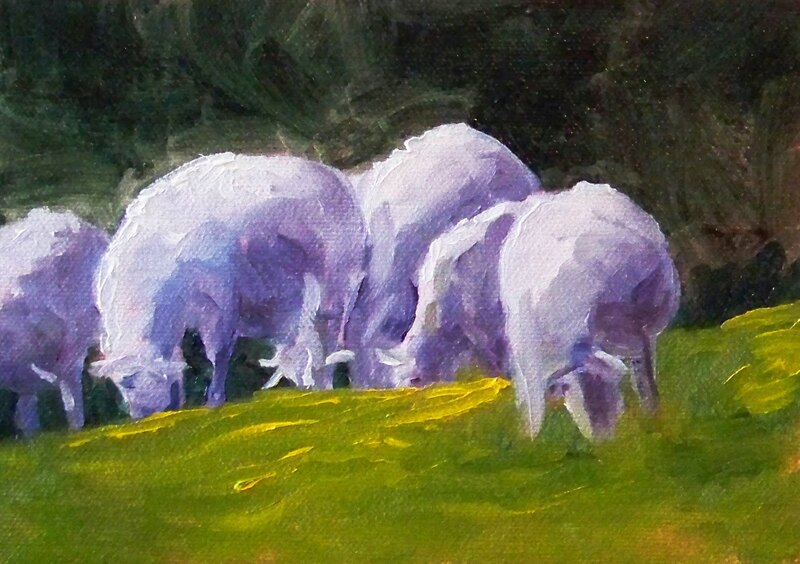 The munching herd is on a 5x7 inch Raymar canvas panel and executed in my usual medium, oil paint. At present these little fellows are sitting on the drying rack, but it won't be long until they join some of my other animal paintings in the Small Impressions Gallery at Etsy. Today I took a nice long ride on my bicycle and practiced using my new clipin pedals. No falls, no disaster, just a nice long ride in great weather. This painting was inspired by a segment of the Foothills Trail I followed on my ride today. The painting is 8x10 inches. SOLD. Last evening I spent some time organizing the paintings in my Small Impressions Gallery into sections. If you visit and look at the listings on the right of the shop, you can see the new sections that were created last night. I'm very happy with the new organization. 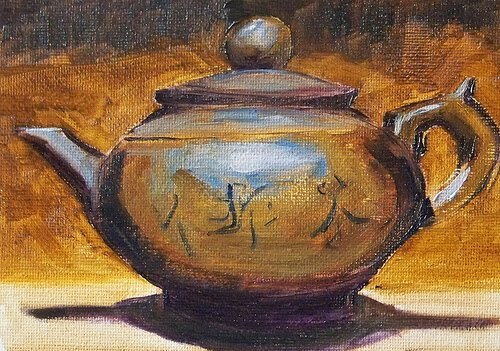 Painting every day is a great way to improve skill, but it also creates a lot of paintings. I sell them online to pay for my supplies and art related activities, but after a while the gallery can get pretty cluttered. Being organized is a very satisfying experience. 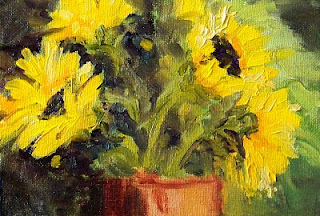 It felt good this morning to list a new painting, this 5x7 inch oil painting, in a well-organized shop. Stop by and visit. This painting can be purchased for $40.00 plus $6.50 for shipping to US addresses. I've been experimenting with some different washes lately. 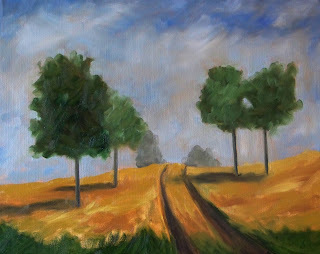 This painting began with a yellow ochre wash. I wanted the painting to be warm and sunny. The underpainting did the trick. It is 9x12 inches on stretched canvas completed in oil paint. I've been on a grand adventure the past few days. This painting represents how I've been feeling--things are a bit unclear, but I know there is some sunshine underneath the fog. The adventure has to do with purchasing new shoes and clip-in pedals for my bicycle. I've never had clip-in pedals before, just stuck with the pedals that came on my bike. 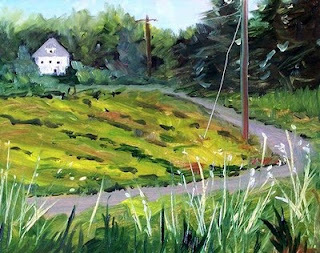 This summer, however, I've noticed that as I climbed hills, my feet were slipping off the pedals and I was feeling very inefficient, often the last person to get to the top of the hill in spite of my hard work. I've been told many times that clip-in pedals would help me, but I've been reluctant because everyone I know who clips in to their pedals has taken spills. I'm a big chicken; I didn't want to fall. But, I took the plunge, purchased pedals and shoes and took to the road. Sure enough, two falls, a skinned elbow and knee, but going up hills was like sliding on butter. I'm still on the learning curve, things are a bit misty, but I know there is some sunshine coming when I master my new pedals. My painting is 16x20 inches, oil on stretched canvas. Eventually it may find its way into my gallery at Etsy. For now, it is on the drying rack awaiting the future. One thing I really love about summer is the opportunity to ride my bicycle in warm weather and sunshine. When I'm on my bike, I feel like a kid with wind in my hair. I find inspiration in the sites that I pass, often taking my camera along on my treks. Inspiration for this 8x10 inch painting arose from one of my treks. An old country house with the front yard planted in a big garden captured my attention. My quick snapshots provided great references for recreating the scene back in my studio. This painting can be purchased for $125.00 plus $12.00 for shipping to US addresses. 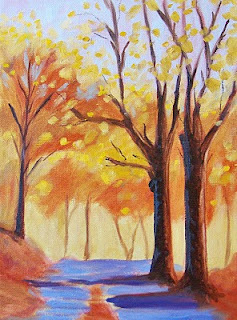 Visiting my online gallery, Small Impressions, will give you an opportunity to put the painting in your shopping cart. Here she is, the sheep with the golden fleece. Some of you may have seen my earlier version of this sheep. Originally painted on a 5x7 inch canvas panel, I decided the colors were so rich that I wanted to paint her again in a larger size. This painting is 9x12 inches and is painted on stretched canvas. It is a habit of mine to audition paintings in small sizes and then, if I like the outcome, enlarging the painting. Sometimes it works great and sometimes paintings are meant to remain small. This painting translated very well to a slightly larger version. The Painting is for sale online for $135.00 plus $12.00 for shipping to US addresses at the Small Impressions Gallery. The sun is out and I've gone crazy this week picking and painting flowers from my yard. Calendula, daisies, and some other yellow flowers of which I cannot name have all crossed the table in my studio the past couple of days. 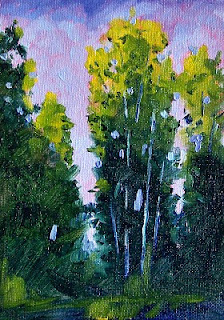 This painting is 5x7 inches on a canvas panel and is for sale at my Etsy Gallery for $35.00 plus $6.50 for shipping to US addresses. This painting is 5x7 inches on a hardboard panel. 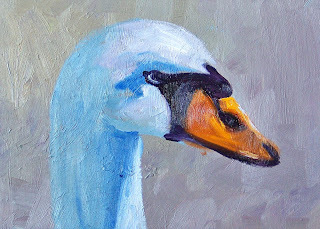 Created in oil, I especially loved working on his bill and the shadows on his neck and around his eye. He is now for sale at my Etsy Gallery for $50.00 plus $6.50 for shipping to US addresses. Shipping to Canada and Mexico is $10.00. Click here to purchase or take a minute to look at my other animal paintings. This painting is one of my Carbon River series paintings. There is a great bicycle trail that parallels the Carbon River in Washington State. Views from the bank and along the trail have often inspired my art. 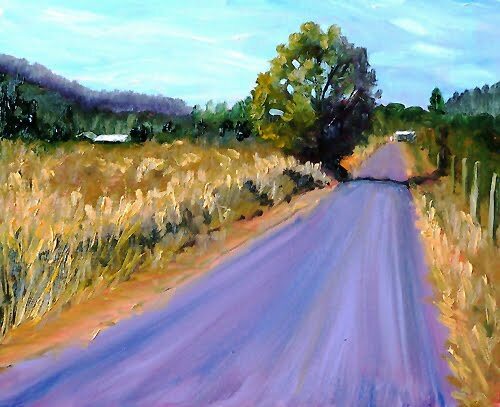 I painted this scene several times with different underpaintings and color choices. 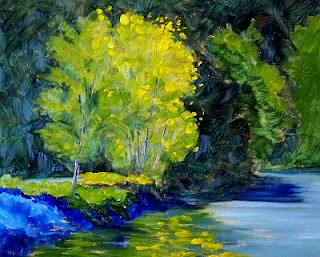 This particular painting leaned heavily on blue as part of the color scheme. 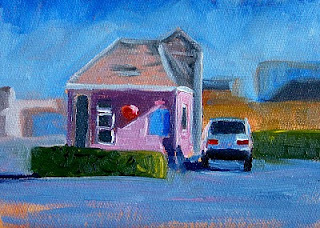 It is 8x10 inches on a hardboard panel and is now for sale at my online gallery, Small Impressions. Stop by for a look or click to purchase the painting. Shipping is $12.50 to US residents. 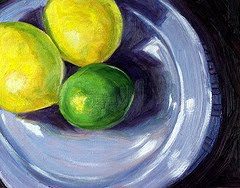 Bright lemons and a lime are the color of summer. Today's 8x10 inch oil painting is one of my favorites. I'm pleased to be able to offer it for sale at my Etsy Store, Small Impressions Paintings. It was painted on a hand prepared gessoed hardboard panel with professional grade oil paints. I like it when a favorite painting emerges on one of my hand made panels because I know the work will last a life time. It can be purchased here for $125.00 plus $6.50 for shipping to US addresses. It will be a great addition to a kitchen or mightbrighten a dark alcove. I'm anxiously looking forward to finding a home for this painting so it can be appreciated rather than sitting in my storage cupboard. Click here to purchase using Paypal, a safe and reliable online method of transferring money. If you are looking for a companion piece, check out some of my other small still life oil paintings. In the summer I seem to notice the heighth of the trees more than any other time of year. Perhaps it is because I spend more time outside or maybe it is because of the cover of leaves that emerges when the weather warms. Whastever the case, this painting was inspired by the stands of tall trees that I notice each summer. 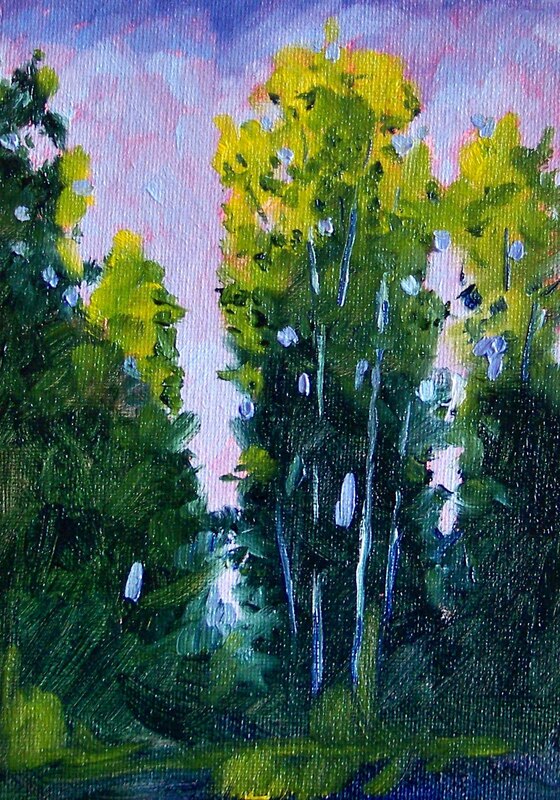 Though the trees are tall, the painting is small. It is 5x7 inches and completed with oil paint on a canvas panel. This little gem is now for sale for $35.00 plus $6.50 for shipping to US addresses. A collection of these small paintings works well in little alcoves. I have six of them framed on the wall of my guest bathroom. It makes it feel like I'm in a little forest with scenes of nature all around. 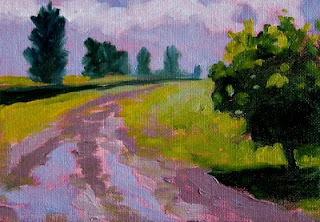 You can view more of my little landscape oil paintings at Painting Small Impressions. They make for wonderful little groupings. 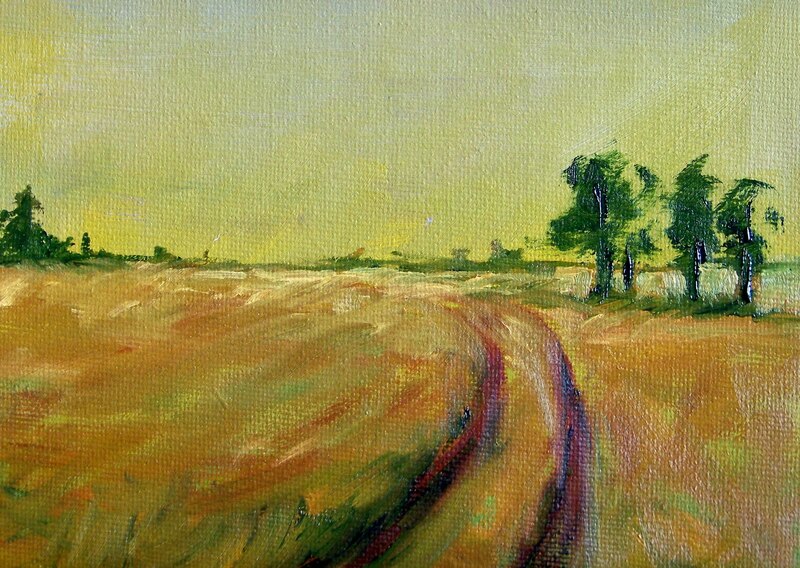 When I painted this 5x7 inch oil painting, I tried to capture the vastness of the open meadow and the beauty of the grass. I've added it to the Small Impressions Gallery where it can be purchased for $35.00 plus $6.50 for shipping to US addresses. It was created on a canvas panel and will fit easily into a standard frame. Put it in a Paypal shopping cart by clicking here. Paypal is a safe and easy way to purchase online. 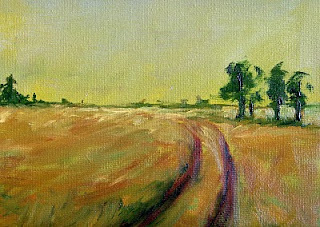 You might also want to purchase a companion painting from amongst my other original small landscape oil paintings. Summer has been a wonderful opportunity for lots of painting during the long hours lof daylight. I'm a prolific painter when the light is long, but I've been so engaged with my painting, I've neglected my Small Impressions Gallery. In order to get back with it, I've placed a new painting up for sale. This little 5x7 landscape is painted in oil on a canvas panel and is the first new painting I've listed in quite a while. It can be purchased for $35.00 plus $6.50 for shipping to US addresses. Visit the Gallery to see some of my other small landscape paintings. 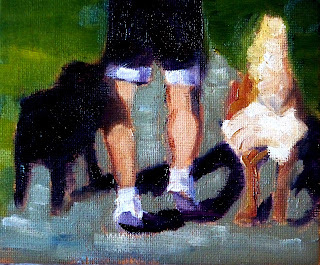 This painting is 5x7 inches and is one of several I've worked on recently with a subject of people and thier dogs. Spending the week of July 4th at the beach provided me with a much needed dose of sunshine and a lot of inspiration for painting. Dogs seem to love the beach even more than the people who take them there. Wide open spaces, unusual smells, and lots of fun draw our dogs to the beach as well as ourselves. 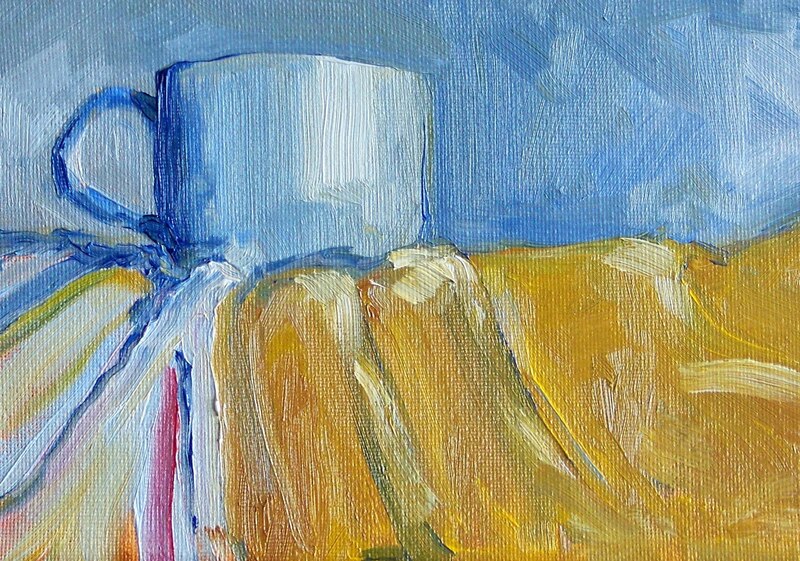 This little painting is 4x5 inches, a very small size, even for me, but it seems to have turned out well. As I worked, I was concentrating on the shapes and the shadows. My hope was to capture the high contrast of the afternoon sunlight. It was a fun subject and I think it was successful. 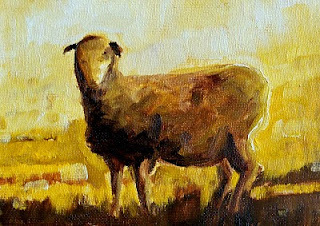 It has been a while since I have painted sheep. 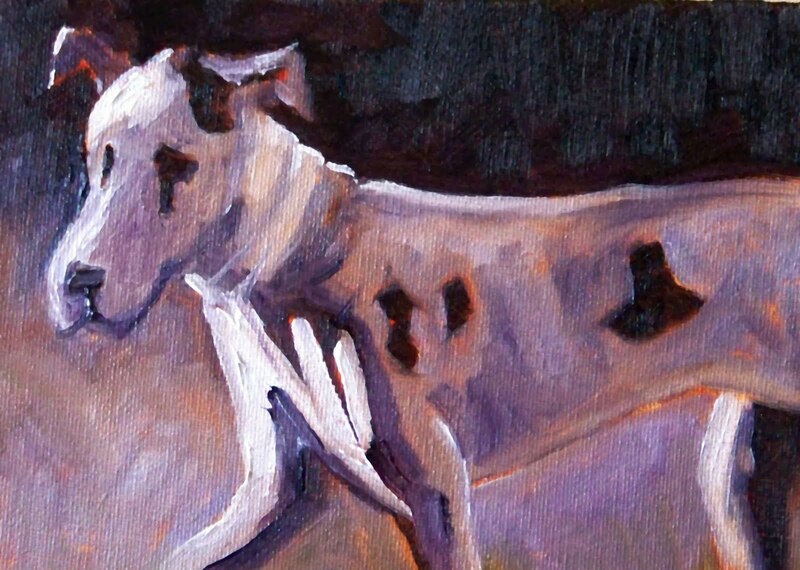 I used to paint them quite often, but drifted away from the subject. 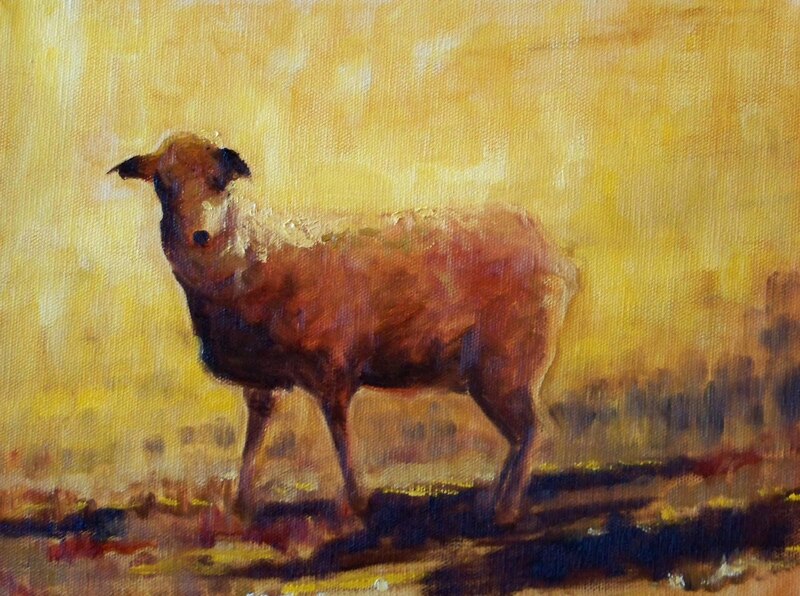 What excited me about this painting was not the sheep, but the evening light. I used a palette of cadmium yellow, yellow ochre, burnt sienna, raw sienna, asphaltum, and white. Asphaltum is a nice transparent, deep redish brown, one I seldom use, but definitely appreciated in this painting. 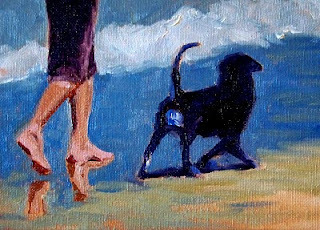 The painting is 5x7 inches on a canvas panel. After a week's vacation, I'm now painting memories. Over the 4th of July holiday I spent some time in the small beach town of Ocean Shores on the Washington State Coast. Several mornings we were up early and pedaled our bicycles five miles into town and bought coffee at this little road-side coffe stand. It is called Go Dog Go because they also sell gourmet hot dogs. It was a delightful way to start the day. This little oil painting is 5x7 inches on panel. I was struck by the wonderful light and shadows on the side of the building. Today I worked on painting drapery and a white ceramic cup. Both are a good little challenge. After several versions of the white cup, I decided that this 5x7 version sitting on a couple of dish towels was my favorite.